Find more than the perfect shade of white by taking our Wedding Dress Style quiz! This pristine hue is best suited for organza or chiffon gowns. Opt for embellishments, as embroidered lace and sparkling Swarovski crystals look stunning against this crisp colorway. Planning an outdoor wedding? A bright white gown also looks perfect against a beach sunset or candlelit garden. 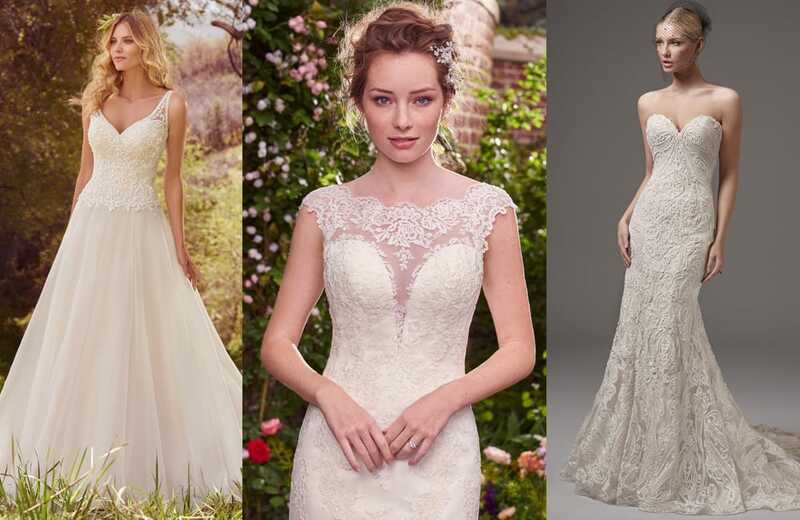 This timeless shade lends itself nicely to vintage inspired gowns, particularly in lace. 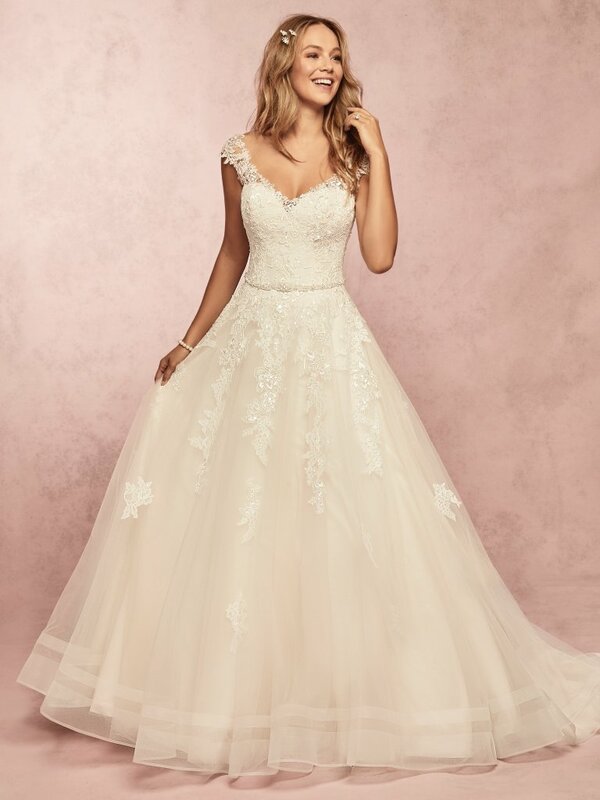 Our Ariella wedding dress by Maggie Sottero is the epitome of vintage glam in this soft and romantic colorway. What’s the difference between white and ivory? The traditional choice is a white wedding dress, but our bridal salons offer more options now than ever. In terms of color, white is a bright, pristine white with no mixes or shades of any other color. Ivory has a slight tint of yellow or cream. 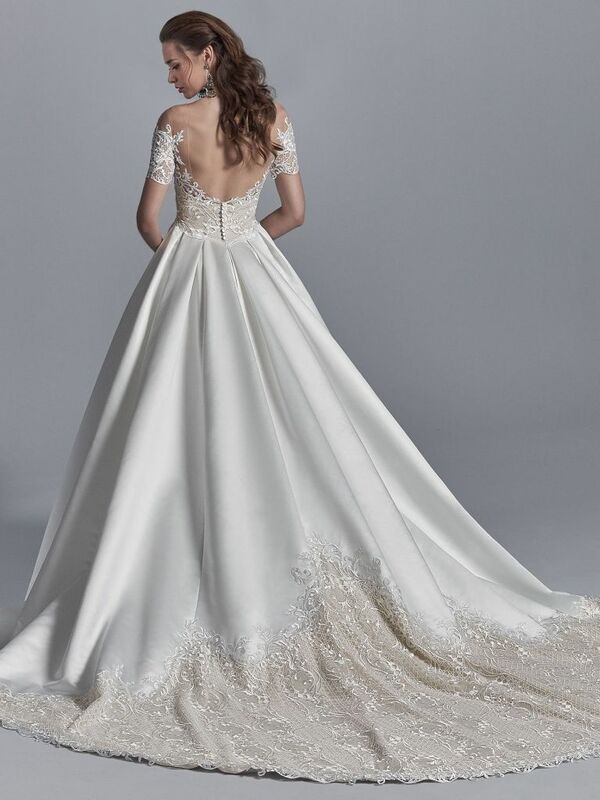 The difference in the shade of white can be seen when viewed in full light–a white gown will almost look a little blue. Choosing a wedding dress that complements your natural skin tone is the secret to looking your best on your wedding day. 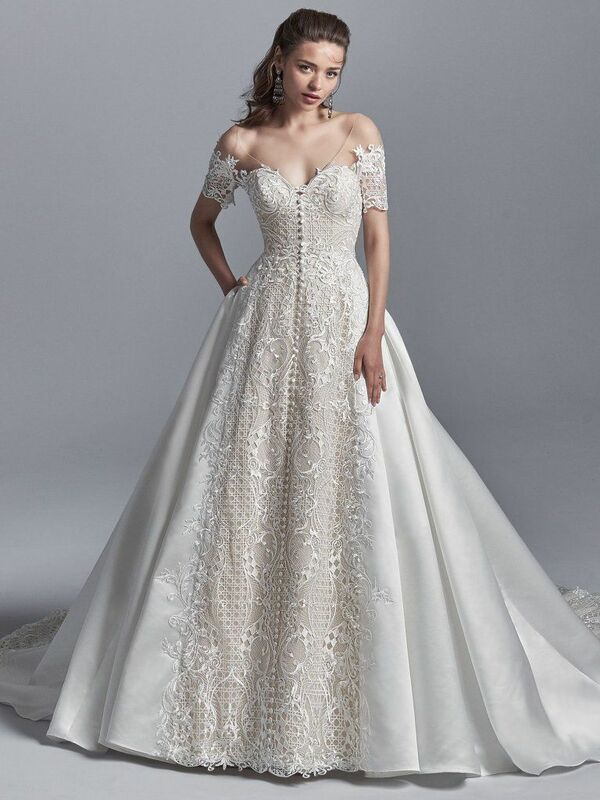 When deciding whether to go for an ivory or a white wedding dress, skin tone should be your number one priority and consideration. 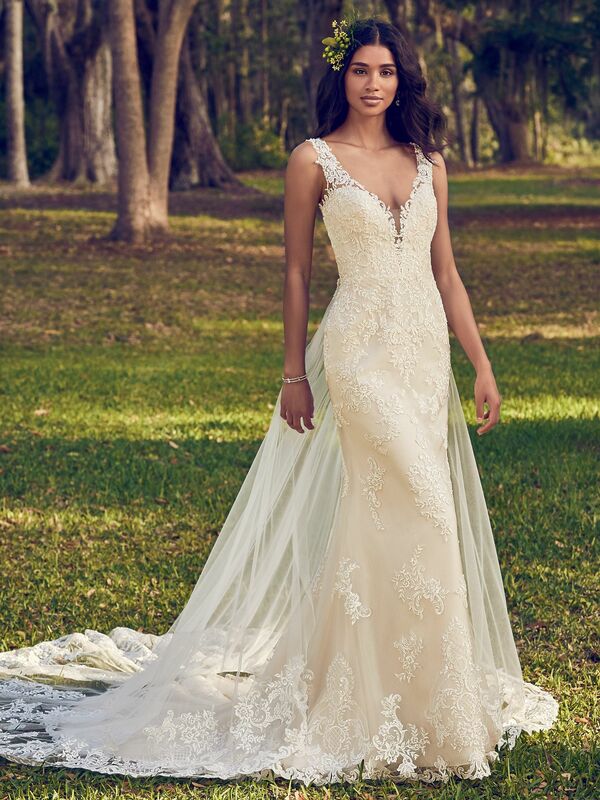 A true white wedding dress is an excellent color for dark-skinned women or women who are light-skinned with yellow undertones (olive or ivory skin). If you have fair skin, the best colors for you are shades that have ivory or yellow undertones. Wearing a true white dress may make pale skin tones look washed out. Ivory shaded gowns bring out the details of your dress well, such as intricate embroidery or beading. True shades of white can be a difficult to match with skin tone (not to mention lighting for your bridal portraits). Our diamond white hue is softer than pure white against the skin, and is a universally flattering choice for when you make your wedding dress color selection. This rich and creamy shade is suitable for most skin colors. A velvety satin gown, such as Brennon, emphasizes the regal-ness of an alabaster tone. See more luxe satin ball gowns here. 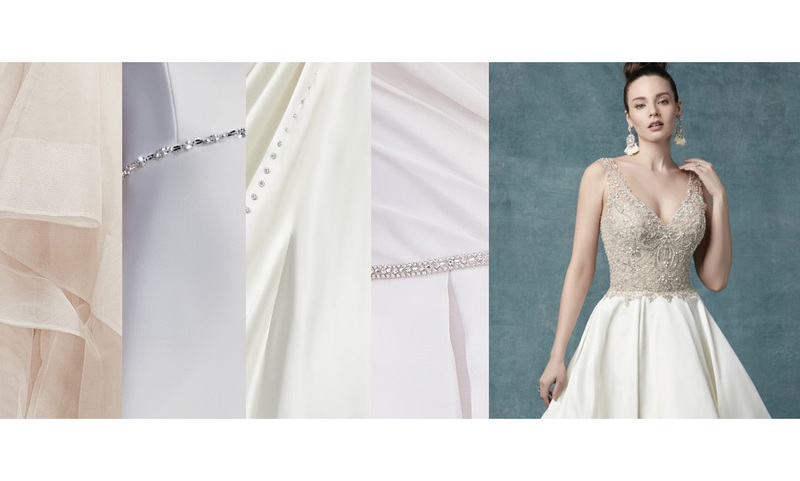 Go for the gold with one of this season’s most popular wedding dress color trends. The glow of light gold makes it a richer colorway than standard ivory or champagne. Pair it with a style in satin sheen, such as our Ettia gown, for a hue that looks dazzling against all skin tones. A champagne-hued wedding dress is all about effortless sophistication. 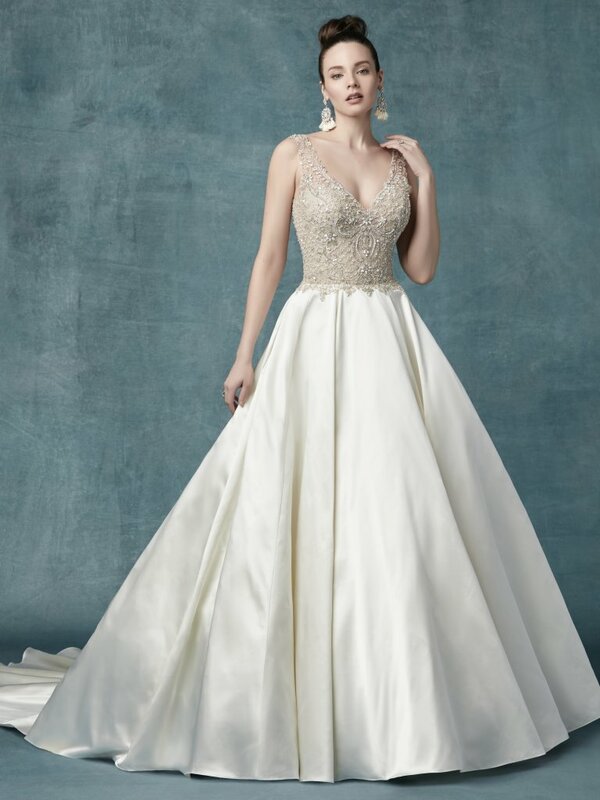 The color of the gown speaks for itself, a distinguished and elegant choice for your once-in-a-lifetime celebration! Experience these colorways and more at an Authorized Retailer near you!